The Thought Leader Incubator, by Authority Magazine, is a program that accelerates the path for executives to be known as an Authority and Thought Leader in their industry. We do this by helping Authorities to author a regular column about their area of expertise. We then syndicate this column to a wide array of national publications. The column has high quality writing, features prominent people, has a high view count, has a high rate of frequency, and is featured in a prominent platform. The authority will then be known as a syndicated columnist in their area of expertise which leads to a whole array of publicity opportunities. We can offer you the following media tools to help you achieve your goal of becoming an authority and renowned thought leader in your industry. 1. Authority Magazine helps you author a column about your area of expertise. The column has high quality writing, features prominent people, has a high view count, has a high rate of frequency, and is featured in a prominent platform. Our team will help you write an interview/article per day with as little as a ten minute daily commitment. Within a year it is possible to create more than 300 high level interview/articles. All articles mention your business and expertise. 2. We then to introduce you to editors at premium or prestige magazines who might syndicate your column to their outlets. Each month, we can introduce you to editors at publications such as Forbes, Forbes Woman, Buzzfeed, ThriveGlobal, NewTheory, Equities.com, Seeking Alpha, Today.com, PopSugar, Fast Company, Inc, Entrepreneur, National Geographic, Bustle, and Swaay. Some of these outlets will give you dashboards that can allow you to instantly publish there without editorial lag time. You can embed your videos in many of these outlets. This will allow you to attract and connect to very high caliber talent for your interviews. In addition, becoming a syndicated columnist helps to brand you as an authority in your field. 3. We will arrange for you to speak with, meet and interview leaders or top CEOs in your industry. Here are some people we have previously featured. These connections and relationships can be invaluable to your business goals. 4. We will connect you to feature and interview social media influencers who will share your content, and give you a lot of exposure and attract followers. 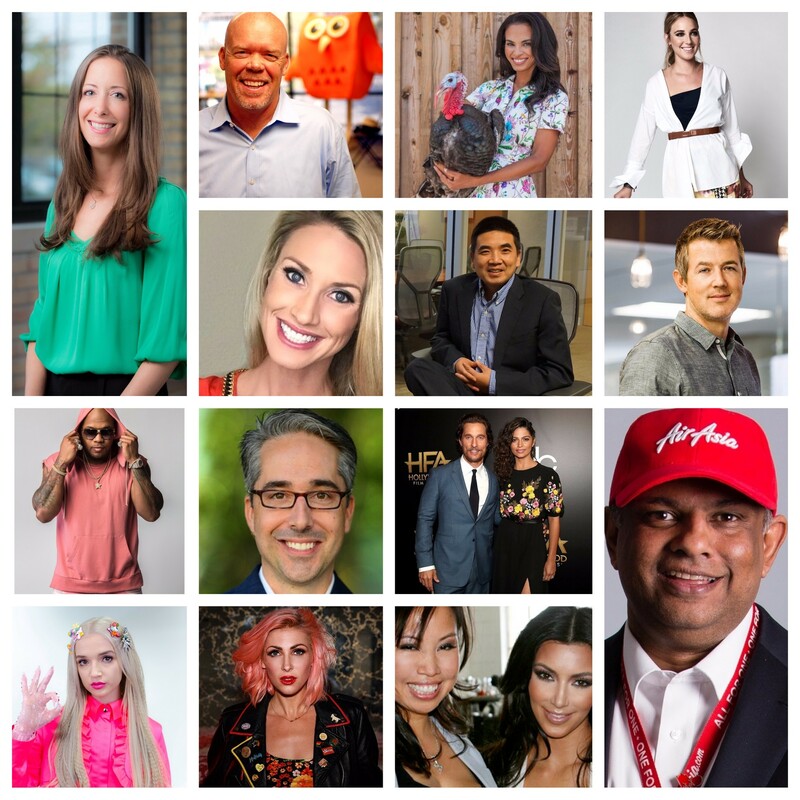 Some of these influencers have more than 2 million followers. Here are some people we have previously featured. 4. We will connect you to top level VC and Angel Investors. These connections and relationships can be invaluable to your business goals. Here are some people we have previously featured. 5. We will connect you to interview A-list celebrities including sports stars, music stars, and film stars. Here are some people we have previously featured. 6. As a regular columnist, you will receive press passes to cover exclusive events such as the Emmys, Sundance, Comicon, and SXSW. 7. We will help you create and launch your own podcast or videocast, featuring celebrities and CEOs who we introduce you to. Now, in addition to a regular column, you will also create video and audio content that engages new audiences. · Help you to envision the format, flow and layout of the book. · Help you gather and curate all of the content. · Help you write your own ideas. · Help you edit it. · Based on the content, guide you to independently publish it, publish it for you under Authority Magazine Press, or pitch it to prominent publishers for you. 9. We will help you write stories that will get you invited as an expert with our contacts on local TV and then national TV. 11. We will help you get enough media mentions to get your own Wikipedia page. 10. We will help you get invited to TEDx and TED central. Here is an example of someone in our network who can help you. 12. After your TED experience, we will help you enter the executive speaking circuit. 13. If you reach this stage you will have all the tools at your disposal to be recognized as a leading thought leader of your industry. If you think you might qualify for this program please email us at or email at editor@authoritymag.co . Consulting fees begin at $2000 a month. Please note that TLI is not affiliated or employed by any of the brands mentioned above. TLI serves to consult, guide and educate, and cannot promise acceptance into any particular group.